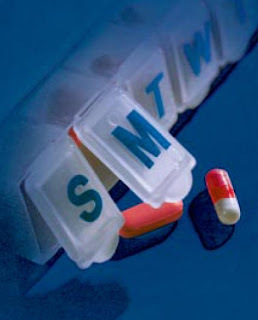 The World Health Organization (WHO) report “Adherence to Long-Term Therapies” estimates that between 30 and 50% of medicines prescribed for long-term illness are not taken as directed. Technically, adherence is defined as the % of doses taken as prescribed for the entire period of study. That's subtly different from "compliance," which is the % of doses of a drug taken as prescribed while the patient is actively taking drug. The word "compliance" implies that physicians should dictate treatments to patients, who will either do as they are told (comply) or do wrong. Leaders in the pharmaceutical consumer relationship field reject compliance as an unworkable concept which fails to recognize not only changes in how we all consume health care, but also the vast differences in how individuals relate to their condition and their medications. Assuming most medicines are effective, it is imperative that they be taken as directed. Thus, better "adherence" benefits patients as well as drug companies, which lose a lot of money if patients are not taking their products as prescribed. These days, when access to physicians is limited, pharmaceutical marketers need to find other ways to bring in income other than through new prescriptions -- they need to improve adherence. The WHO states that there is no single intervention strategy, or package of strategies that has been shown to be effective across all patients, conditions and settings. "Consequently," says the WHO report, "interventions that target adherence must be tailored to the particular illness-related demands experienced by the patient. To accomplish this, health systems and providers need to develop means of accurately assessing not only adherence, but also those factors that influence it." Unfortunately, the approaches that many pharmaceutical companies continue to use to drive improved adherence depend upon a mass market, one size fits all approach. What's needed is a true consumer relationship marketing approach. That is the subject of an upcoming Pharma Marketing Talk interview with Greg Caressi, Senior Vice President, Healthcare & Life Sciences, Frost & Sullivan, who will briefly discuss the benefits of utilizing a targeted approach when designing a pharmaceutical adherence and loyalty program. For more information about that interview, see here. This interview is in an introduction to the complimentary eBroadcast on the same topic (see "Targeting and Tailoring your Adherence Program to Optimize Performance"). The eBroadcast will include a panel of experts, including Greg Caressi, Dr Andrea LaFountain, Founder and CEO of Mind Field Solutions, and Greg Zych, Marketing Manager, McKesson Patient Relationship Solutions. Note: Pharma Marketing News -- my FREE monthly newsletter -- is a paid Media Partner for this eBroadcast. I plan to attend and summarize the discussion in an upcoming issue of the newsletter. I am trying to find the market size for adherence programs. Any ideas? Pretty close to zero is my guess! Depends what you mean by "market." Do you include pharmacy "switch" letters sponsored by pharma companies? They may think of these as adherence programs.